Anna Kara has emerged as one of the most exciting and distinctive collection of bridals in Europe with an unyielding reputation for innovative designs. 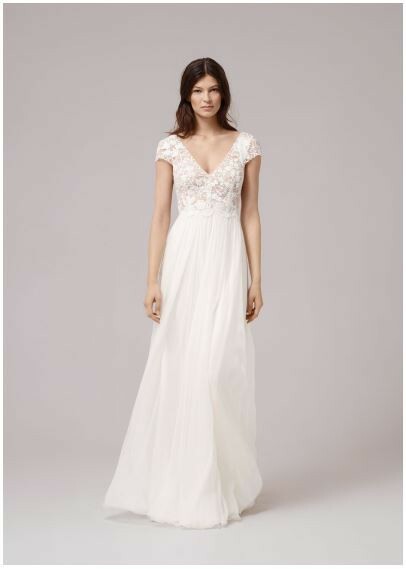 Anna Kara gowns capture the romantic and charmingly aesthetic features that elegantly merge. The exclusive and unique bridals display an intractably rich European sense of style and mood, which have managed to fast win the industry's praise and fashion critics rave reviews. Definitely can be altered to suit you! I had cleavage reduced just prior to wedding, so I know it can be made smaller or bigger, given the extra fabric. Flowy, light dress, comfortable yet very elegant. Simple shape. Once you send a message, Meggy can invite you to purchase the dress.